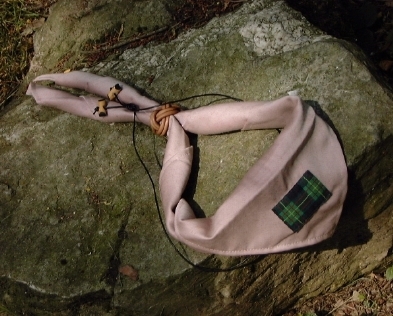 The three symbols that represent the completion of all the Wood Badge requirements are the Turks Head Woggle (part 1), and (upon the completion of part 2) the Gilwell Scarf and Wooden Beads (wood badge) on a leather thong worn around the neck. Of course there is a long history attached to each symbol. 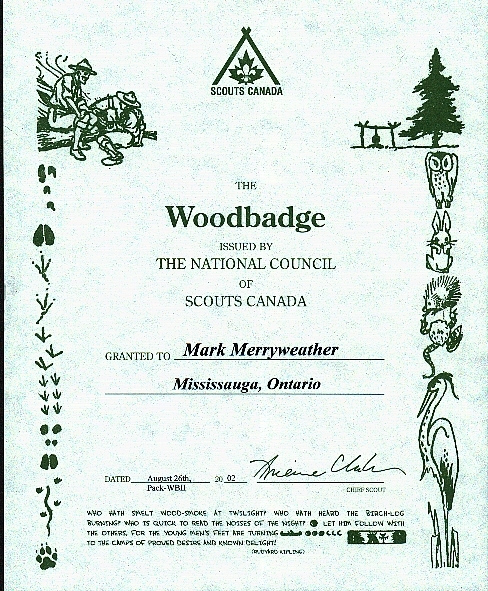 Scout Associations worldwide adopted the beads, scarf and woggle in Niagara Falls, Ontario circa 1955, as representing completion of the Wood Badge training. Upon completion of Woodbadge Part II, scout leaders are presented with a parchment (certificate), beads and scarf. From that point onward the Scouters are known as Gilwell Scouts or Gilwellians. Traditionally, Part II participants have to design a badge, crest, or t-shirt that symbolizes their experience in Woodbadge II training. The crest must incorporate wooden beads, the dates the course took place, type of course (pack, troop, company, colony) and location. Our theme was "train_ing" so we decided to incorporate the Gilwell symbol of an axe in a log and add train wheels to it. We also added a wolf cub symbol to the log and our energy check phrase - "We Love This Stuff"